There’s really nothing else quite like the Father/Son Team Day. For more than 30 years Christian Service Brigade has provided this annual day of competing in fun games and events with your son as a dynamic duo! Garbage can canons, matchstick guns, bean bag launching, air pistols, archery, canoeing, and other fun competition games! Have you been wanting to take your son camping but can’t seem to organize the thing? Come the night before the Team Day for a free optional camp-out. Bring your tent and a few supplies and we’ll do the rest. A BBQ lunch and free flowing coffee are included as well. $ 35 per man and $20 per boy. If cost is an issue please just email me: dgregg@csbministries.org (Dave Gregg) or call me (510-209-3678). We want you to join us and would be happy to work out an arrangement that will make your participation possible. Please submit/postmark your payment and registration on or before Friday September 30th. If payment will not be received by October 4th please note in the comment section that you will be bringing payment to the event or email me: dgregg@csbministries.org to that effect. The competition takes place at the Kiwanis Youth Camp in La Grange, CA (East of Modesto) starting at 8:30 AM on Saturday and ending around 5 PM. The memory verse is a key "event" for the day. It is heavily weighted and can very easily help make the difference in winning the overall age group award. You can use any version you would prefer but if you do not use the ESV then please bring a copy of the version you are using to the event so that judges can use the proper version. This year's verse is located on the sidebar to the right (on a desktop) or scroll down on a mobile device. Take Hwy 99 to Modesto. Exit at Hwy 132 East. Follow Hwy 132 through Modesto approximately 15 miles to Waterford. The site is about 40 minutes east of Modesto. Continue through Waterford on Hwy 132 and drive an additional 17 miles toward La Grange. Immediately after crossing the Tuolumne River bridge, turn right on Lake Road, and then turn left through the gate into the Kiwanis Youth Camp. There is a sign there for the campground. There is a free opportunity to camp out at the competition site the night before for any dads and sons who would like to do so. There is no additional cost for this and it is an additional opportunity to spend time together. The gate opens at 5pm on Friday. Each dad and son pair compete against other dad and son pairs in the same age group. For dads coming with multiple sons you will do each event with each of the sons that you bring. This means that dads with multiple sons will be ... how shall we say it ... very tired by the end of the day! A barbecue lunch is provided in the cost of registration. Snacks are available for purchase. Water is available the whole day. If you are coming for the free camping the night before, you will need to provide dinner and breakfast for yourselves. Often dads and sons just stop for fast food dinner on the way and bring a simple breakfast for the morning. We will have hot water for you if you want it for food like instant oatmeal. We will have Donuts for purchase for breakfast! Our speaker has a passion for families, especially the enormous challenge of being a husband and father in a culture hostile to Biblical notions of both. He will bring a message that is encouraging, challenging, and useful in equipping fathers and sons to stand strong in the midst of a culture that wants us to believe that this is no longer possible. Is there a boy without a dad available to participate? Consider being substitute dad for the day! Substitute dads must be at least 10 years older than their “son.” Substitute dads will need to bring a medical release which you can download here. Boys love to win. Trophies are awarded to the top teams in each age group. Ribbons are awarded to the top scores in each event in each age group. Every boy will get a ribbon to remember their participation. It is not necessary that attendees be in great physical shape and you won't be doing any running, but you should bring clothes that you can be comfortable in while you are active. Father/Son Team Day proceeds rain or shine, so you might need a rain coat and rain hat (pray you won't) or a sun hat, sunglasses, and sunscreen (very likely). For dads bringing boys and young men in 5th grade and above, a short canoe race is part of the competition so if you think you might possibly tip we suggest you bring shorts or swim trunks for that possibility. 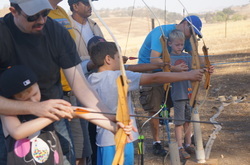 Father/Son Team Day is co-sponsored by Christian Service Brigade and Sequoia Brigade Camp. It is NOT necessary that fathers or sons have any affiliation with a church, CSB or SBC in order to participate. All participants must fill this out and bring it with you to the event. 3. Please bring a check or cash for payment if not already sent.